After a busy last week and eventful weekend, I'm finally sitting down to post. Hi. How cool is this wearable foods series by Yeonju Sung -- constructive art forms made with food. Awesome colors naturally mixed with subtle prints. I'd rock a radish dress. I finally got a juicer and I can't wait to try new recipes. The green juice was on tonight's menu. Anyone have a 'oh-my-you-need-to-try-this' concoction? 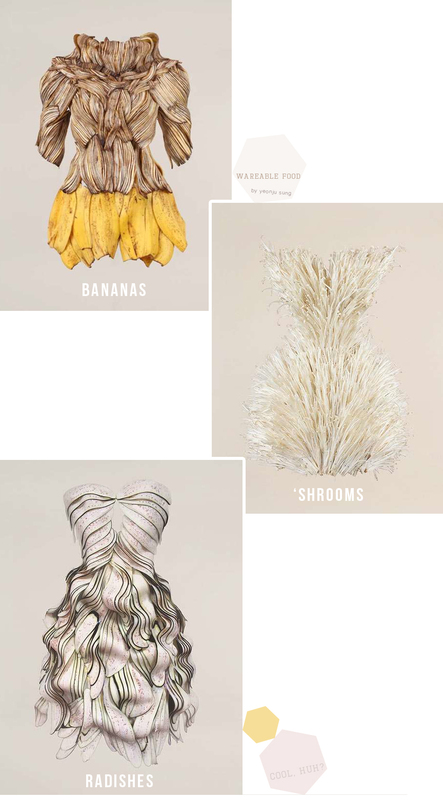 I want the shrooms dress.